That’s why I am asking you to take some time over the next few weeks to think about and offer budget suggestions that will continue to improve our performance. This page also includes the five objectives and three strategic priorities that enable us to achieve our goal. The budget we submit to the School Board in January should align with these requirements. I am very interested in your thoughts about programs, initiatives, one-time investments, or operations that deserve funding consideration. Just as important are your ideas about how we can save money, for example, by discontinuing spending that is not producing the desired results or by offering a less expensive alternative to current spending. Please share your thoughts with your principal, lead coach, or department head between now and the end of October. They will be asked to submit formal requests in early November, which will allow sufficient time to evaluate all of the proposals we receive in preparation for my funding request to the School Board on January 17. 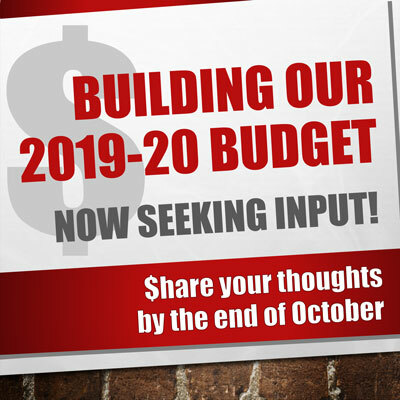 For more information on our budget process, please visit the 2019-20 Budget Development web page. This entry was posted in Budget, Superintendent Messages. Bookmark the permalink. ← Onsite Flu & Tdap Vaccination Clinics Start Today!